Over the past year, corners of the market that have tended to turn together in lock-step fashion have continued to ease off from the correlation extremes encountered in the financial crisis in 2008 and 2009 - as well as the sovereign debt/debt ceiling events of 2011. Those that had closely followed and benefited from trading specific intermarket relationships over much shorter time frames have needed to adjust certain strategies to allow for a greater lag between assets and sectors. 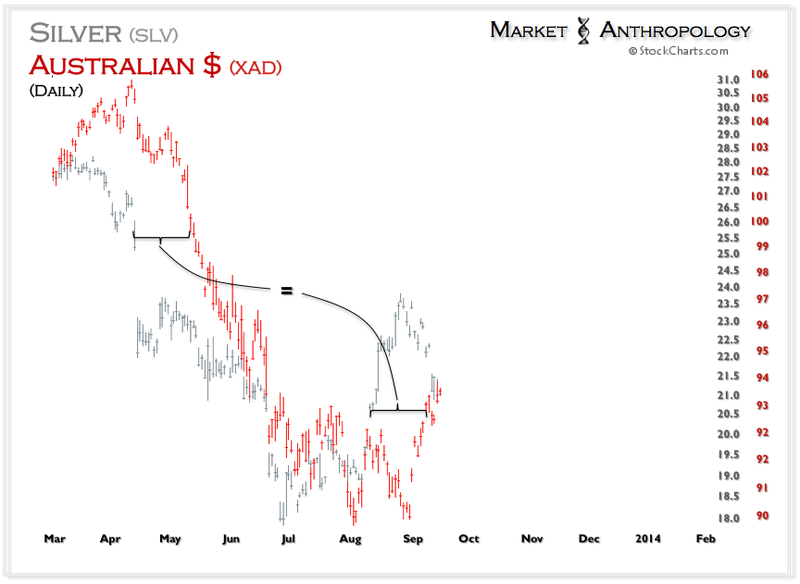 Our silver/Australian dollar comparative introduced in last week's Connecting the Dots note illustrates such point. 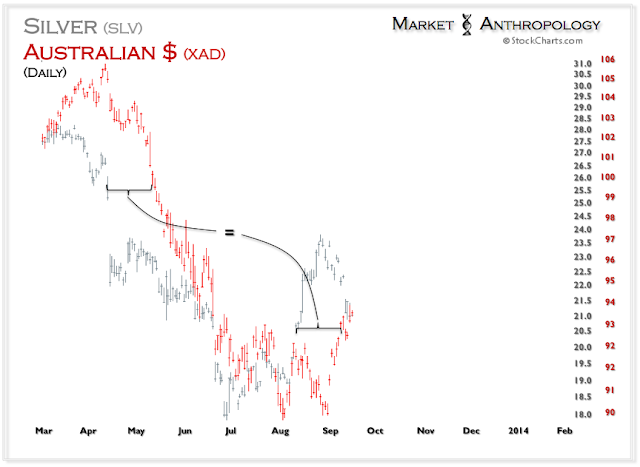 As we described, silver (or gold) has led the Aussie on both sides of the track this year. 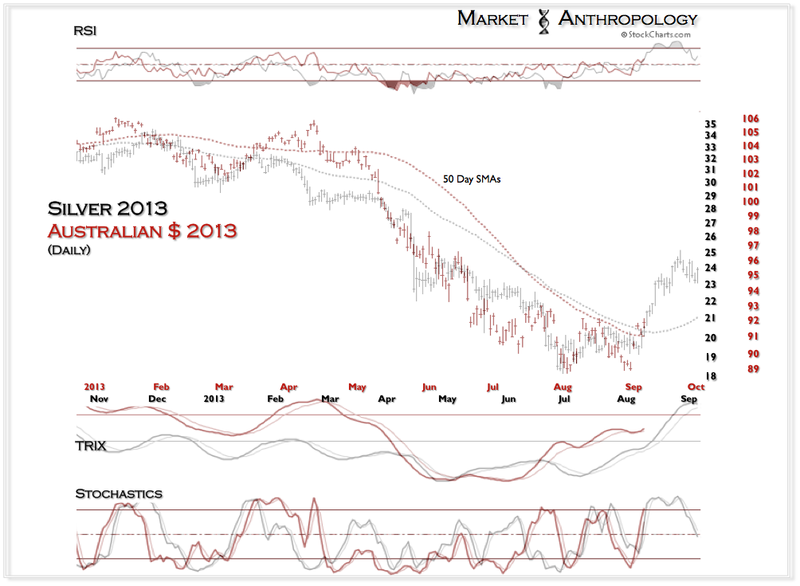 Our current expectations (as shown in the chart below) is that the assets have now converged, but will begin trending higher just as silver reflexively bounced into May before resuming its downtrend with the Aussie into June. On the comparative chart below you can see the largest contrast with silver's move higher is the degree of momentum as expressed with its RSI. 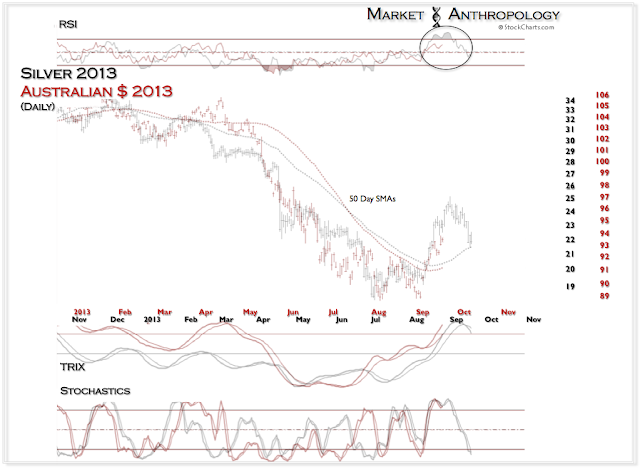 While silver exhibited a substantially more overbought condition that peaked ~ 80 in August, the Aussie is currently trending ~ 60 - as silver has now worked off its overbought condition and currently resides ~ 40.